This booklet provides an overview of storytelling from the perspective of people who have been diagnosed with ‘mental illness’ (in this booklet, we call ourselves ‘consumers’). Most of the available information on mental health has been written by other sorts of ’experts’ – mental health professionals, mental health charities, or researchers who are not consumers. This booklet is different – it is written by people who have been labelled with ‘mental illness,’ based on our knowledge, drawn from our lived experiences. 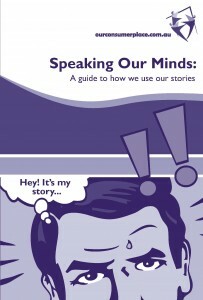 The people who have contributed to this booklet have years of experience sharing their stories in various contexts – with friends / workmates, teaching mental health professionals from a consumer perspective, speaking to the media or speaking at public forums. This booklet is designed to support consumers getting the most out of these opportunities, without too great a cost to yourself.